Get friendly and professional IT Support from Our skilled and sociable technicians. Call REBELLION IT today. Stop troubleshooting the same problems again and again. Find out how we resolve and prevent IT problems and keep business running smoothly. Managed IT Services go beyond basic support to provide companies with IT stability, security, and efficiency. We assess your full IT needs, create a customized IT plan for you, monitor and maintain your systems 24/7, and provide priority IT support when you need it. Your company’s data is critical to business operations. Ensure you have a professional backup solution with redundancy, monitoring, support and recovery processes. We implement simple and redundant solutions to truly protect your data and offer you peace of mind. We’re just a phone call or email away. It’s like having an IT guy who never goes on vacation and works on multiple solutions at the same time. Our team can offer you a wide range of expertise. We help companies improve access, save money, and increase security with the help of carefully selected cloud services for email, documents, calendars, contacts, and websites. 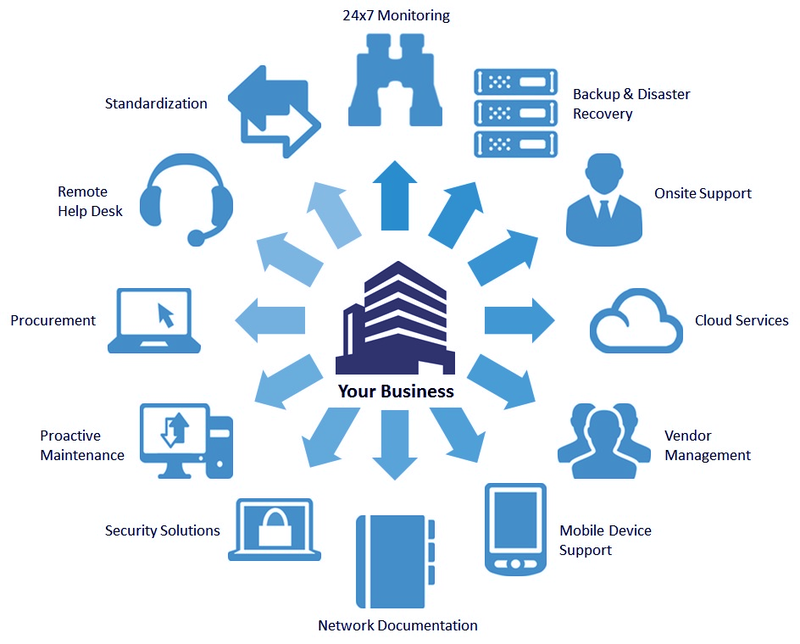 Managed IT Services model to ensure maximum stability, security, and efficiency. Stop troubleshooting the same problems again and again. Find out how we resolve and prevent IT problems and keep businesses running smoothly. REBELLION IT crafts an IT plan and budget for each customer to help them get the best value and strategically select their services and products.